I have successfully burned through nearly all of the hatch chiles I was going to “save.” [shrugs] Oh well, the canned version will do until next August. But before I give in to apples – and then pumpkin and then Christmas lights (because it is a slippery slope) – I have one last recipe using the mountain of hatch chiles that sat on my counter. 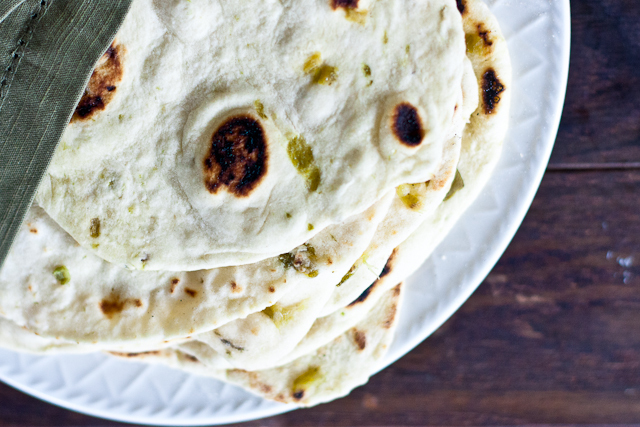 If you’ve ever eaten a fresh tortilla, whether your made it yourself or picked up a still-warm pack from the grocery store (I hope you all have this option one day! ), you know they are so much softer and flavorful than the assembly line version. And if you’ve never eaten a fresh tortilla? Well, let’s fix that now. My HEB sells made-in-store flour tortillas studded with chunks of roasted hatch chiles but you can only get them during their Hatch Chile Fest, which is 2-3 weeks a year. They’re actually already gone and won’t be back until next August. No worries, though. I’ve got you (mostly me) covered. I took my favorite tortilla recipe (it’s the only one you & I will ever need) and infused it with roasted, smokey hatch chiles. And unlike the ones I buy, the smokey flavor – and heat, if you purposely (or not) picked up the hot hatches – is distributed throughout the entire tortilla. 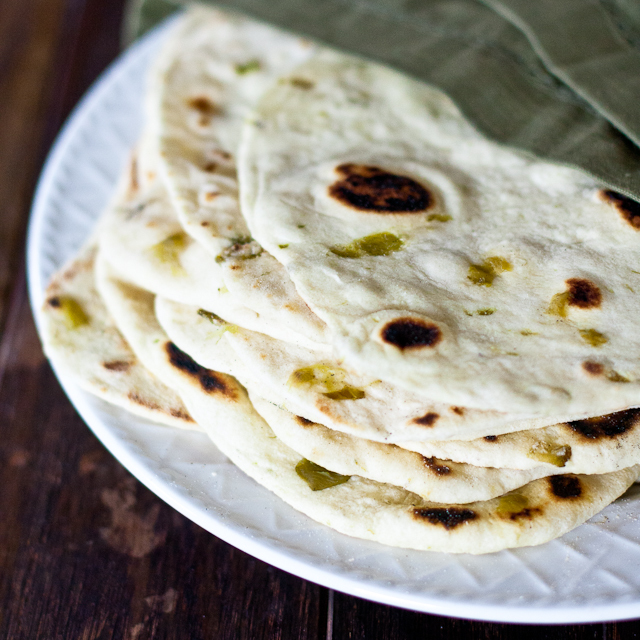 Homemade flour tortillas flavored with roasted hatch green chiles. Pulse the flour, baking powder, and salt a few times in your food processor fitted with the dough blade. Add the fat and process until the mixture is uniformly-ish crumbly. Add the chiles and then slowly stream in the water, just until the dry ingredients form a ball and starts traveling around the bowl (you might not use all of the water or you might need a little more). Turn out onto a flour-dusted surface and divide dough into golf-ball sized portions (I weighed mine out to 2 oz each). Cover with a kitchen towel and let rest for 10 minutes. Heat a large, dry saute pan over medium high heat. With a rolling pin, roll the dough balls into thin rounds, dusting the top with just enough flour to keep the tortilla from sticking to the rolling pin. Lay tortilla flat in the heated pan and cook on each side for ~20 seconds, until the bubbled areas brown. Keep covered with a kitchen towel to keep warm and pliable. Eat warm. Love the idea of putting the hatch chiles right IN the tortillas. Sounds perfect and I can’t wait to try it out! 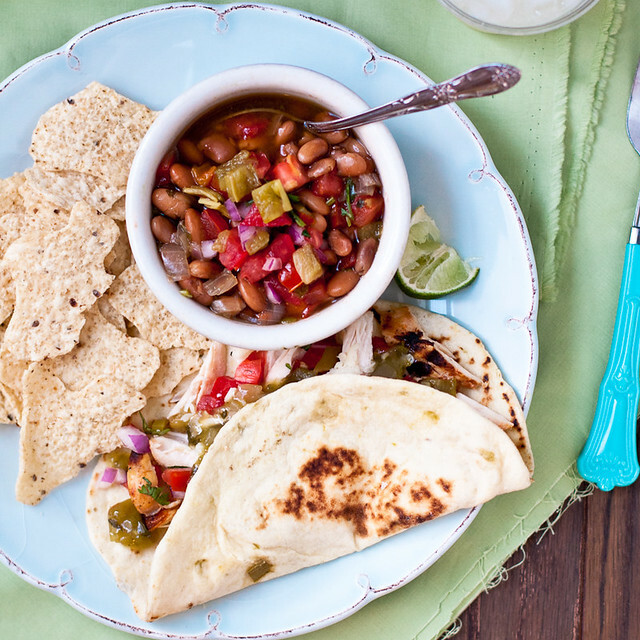 You are tortilla recipe is my all time favorite! I cannot wait to try this version! 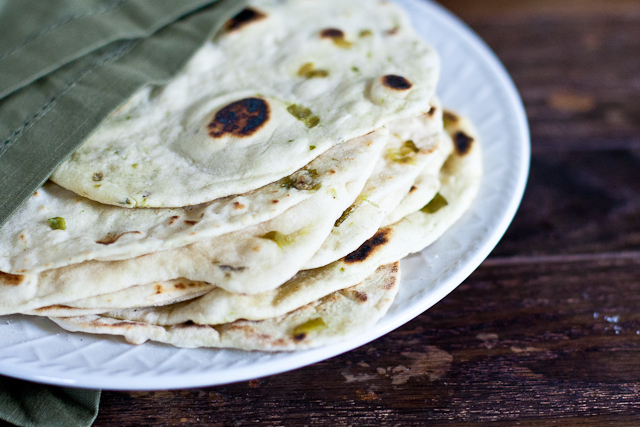 Being that I just got a tortilla presss……I need these RIGHT NOW!! So excited to make them. its a corn tortilla press; you roll out flour tortillas with a rolling pin. oh. my. word. I want to down that whole plate. And side note… I want those beans too!! !